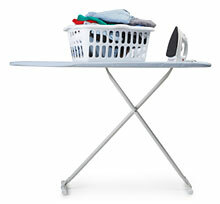 Yes I am talking about one of the most common household chore – ironing. Not that I have any childhood or adolescent memories to share on this topic as I only took up this task 5 years ago, just after we moved out of India. Living in Hong Kong, I did miss all our local door-to-door vendors – the pau-wala (breadman), macchi-wala (fish monger), doodh-wala (milkman), but most of all I missed the istri-wala(ironing man) who would come every morning greeting us with a big smile on his face delivering a neat pile of freshly pressed clothes and bundling up all the wrinkled ones together. I never once gave a thought at how much effort it took to iron all those clothes, pile them up, balancing that pile on a bicycle and getting them delivered to each house….everyday! I took up ironing just like I took up taking care of the rest of the household activities and while I promptly delegated most of the menial activities to a part-time helper, I thought I could manage the two new independent firsts in my life – cooking and ironing and I was 32 years old! While cooking did not help me in any other way except to keep our stomachs full, it was ironing clothes that I actually started taking pleasure in. I would move my ironing board to the living room, get my basket of clothes to be ironed and get ready for the task on hand while sometimes watching an old Hindi movie. I don’t know when I first realised but I got the feeling that the more I ironed, the more I relaxed, I found my mind wandering off to my routine day-to-day activities, things to be done, to-do lists to be created…. all under the fragrance of fresh, crisp laundry. In London it had a dual advantage of keeping my mind occupied and my hands warm. Most of my closest friends know about my affinity towards ironing as this would be the best time for me to have a chat with them and I would often multi-task by giving them a call. With every crease unfolding, I would feel the stress levels go down and a general feeling of peace take over…. maybe now I know why the istri-wala always looked so cheerful? Having said all this I certainly do not claim that I ‘look forward’ to my bi-weekly task with eager anticipation, definitely not! But if I had to make a choice between all the regular household tasks, ironing would be the undisputed winner! So what are your stress-busters at home? With me it's washing the dishes … that's something I really don't mind doing and actually find relaxing. Odd eh! Washing dishes has never been my forte as I dislike doing any job related to water. I remember I used to wear socks with my shoes almost always when I was a child specially in the monsoon as I hated to get my feet wet! Have a rela—xing weekend 🙂 and thanks for re-posting your comment. Dear dear mehroo, finally as i wished great to read about the ironing. I know how much u enjoyed ironing in those list of chatting friends, i remember sitting on the floor, and seeing u amazingly doing ironing all those bundle of clothes with a great smile and loud chat, i miss that dearly. Well i love cleaning the house and setting things right listnening to music of old telugu film songs apart from anything relating to cooking, washing and ironing. I cant do them u know how much i hate ironing, somehow all my thoughts go whooooooooooooooosh the time i start ironing. Well enjoy your ironing and i will enjoy reading ur blogs. Hi sirisha..yes you were in my thoughts when I was writing this post. I do miss those days of 'ironing' chats…made the work load so much easier. still remember the look on your face when I first asked you to sit down on the carpet and chat while I ironed! thanks for being such a fab friend! Finally pleased so much to see ur blog reg. ironing which i always wished to see as u know. I remember those days me sitting on the floor seeing u amazingly ironing the whole lot bundle of clothes while chatting and laughing while we used to talk everything under the sun, miss those days. Well, i love cleaning the house setting things in place while listening to old telugu film songs and singing along with them than washing, ironing or cooking. I enjoy reading your blogs alot.